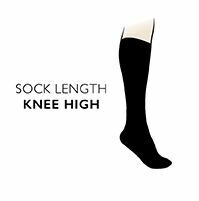 Sexier, silkier, stripier, these exquisitely soft, fine Elle Stripe Wool Knee High Socks come in a viscose/wool mix that allows them to be lightweight, yet warm to wear without chunkiness, to make the absolute most of your shapely legs. The colour choices are totally on trend for this season, taking inspiration from natural spice and berry shades. The socks have a cute contrast heel, toe and embroidered Elle logo, with a deep, self colour cuff. Hand linked toes for smooth seams increase the luxury feel of these socks. There is also a Plain Wool Blend Sock in the same range.